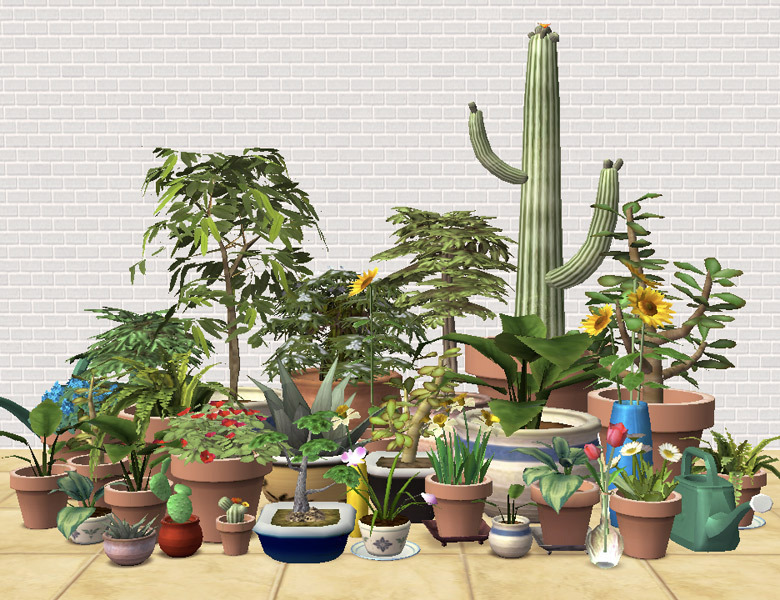 Mod The Sims - Lazy Gardener’s Delight – 32 remixed Maxis plants * Update 2008-05-11: OfB users, please redownload! I made this a "Happy Birthday" download even though it's not terribly apocalyptic – it has flowers after all, and is also the result of a lot of cool new stuff I learned recently, which in the end is what this site is about. Go read the tutorials in the create section, it's fun! Update, 2008-05-11: I used to think that custom objects can't be made placeable on OfB shelves without making them Base-Game-incompatible – turns out that I was wrong. I fixed the placeability, so if you have OfB, please redownload. Thanks for the heads-up! All of the objects are placeable on OfB shelves now, see post #36 of this thread for a screenshot. They're still base game compatible. You may or may not need to re-buy them for the fix to take effect. 32 new decorative plants, made from the base game plants taken apart and put back together in different ways. 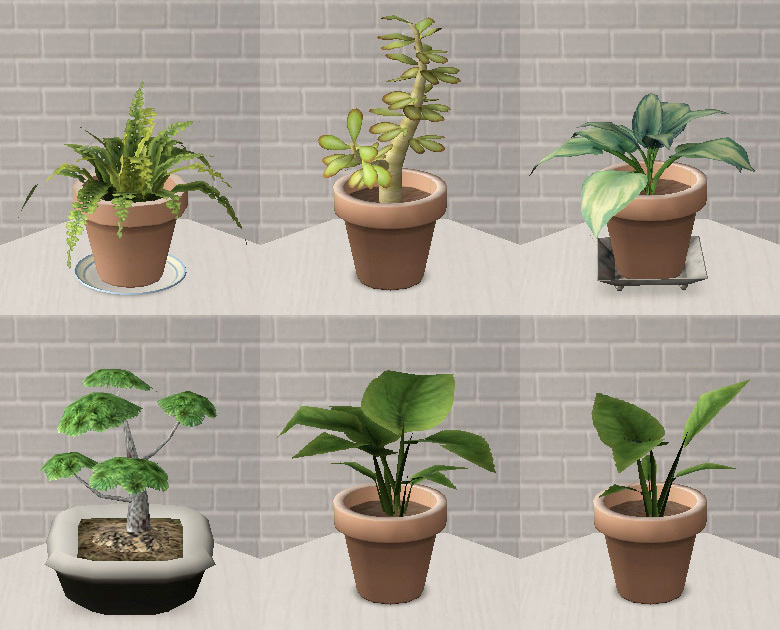 Almost all of the meshes are reshaped in some way (not just enlarged or shrunk clones of the original) and often also cleaned up in the process, so that you can have more than one plant of the same kind and it will still look realistic. Who has one succulent in their house, after all? 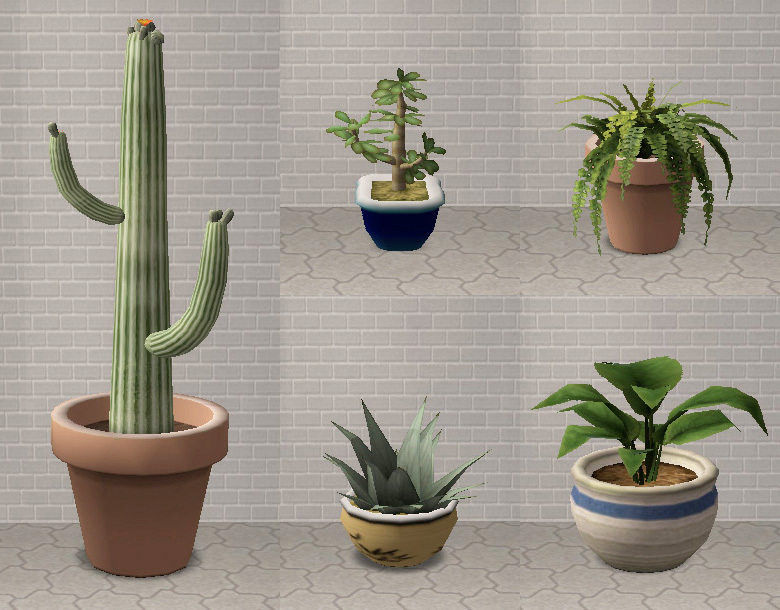 There are no custom textures involved here, everything uses the original ones in new combinations – which means the whole thing is very lightweight, and all recolours you have for the Maxis plants will work for these as well. 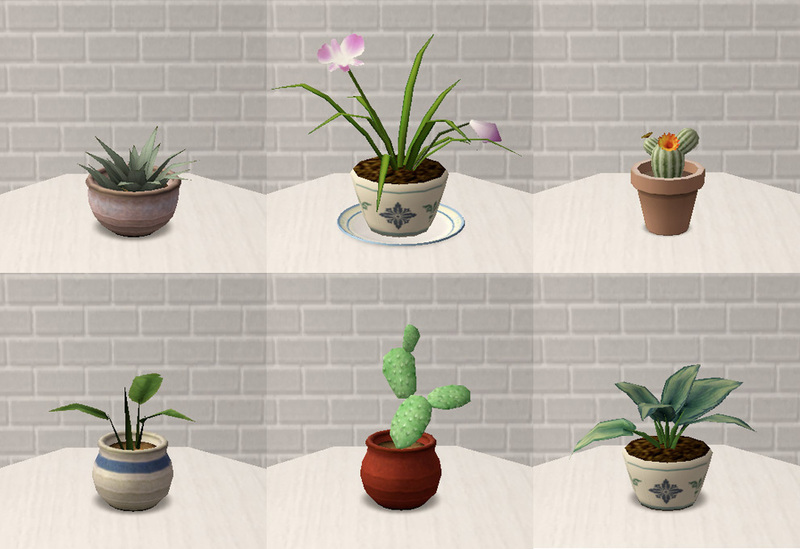 Since the same pots/plants are linked to the same textures each, finally you can colour-coordinate potted plants! All of these plants are decorative, which means they're evergreen and don't need to be watered or trimmed. Lazy gardeners will be delighted, I hope. 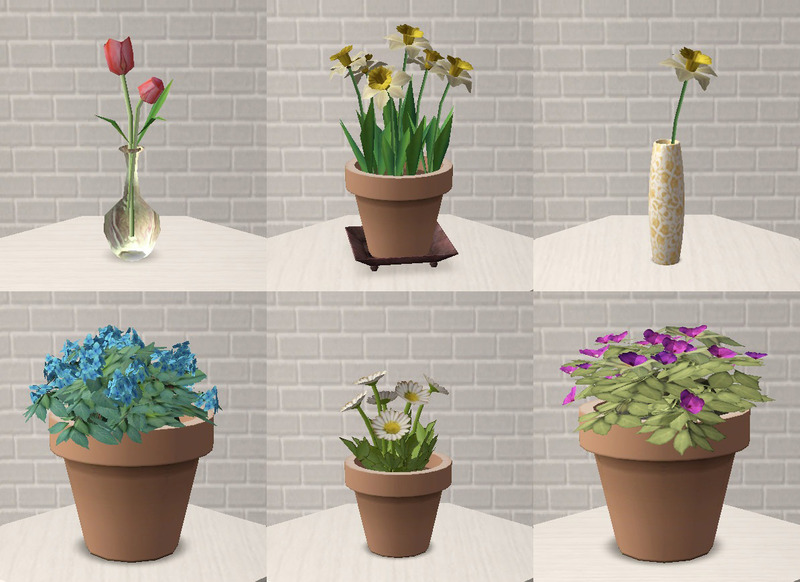 They're in Plants/Decorative (the watering cans too – I left in the Plant Want fulfillment for those as well, since I figured that a sim who loves plants would also love something that plants love). The only part that is never recolourable is the clay pot that is originally from the "Hydroponic Garden" reward – because 1. I'm not aware of any recolours for that, 2. I don't know wether it's recolourable at all, and 3. these pots only come in one colour anyway, which is the one they already have. Aside of the plants themselves, I made three recolours for the Maxis "Simulated Succulent" and one for the rubber tree – the main difference is in the pots (black for the rubber tree, red/white/terracotta for the succulent), but the leaves are also darker or lighter, and one of the succulent recolours has an invisible plant which is useful for making empty pots. Large Cactus – Reduced version of the large outdoor cactus, in a pot from the "Hydroponic Garden" reward. Smaller version of the "Simulated Succulent", shown with a recolour that has slightly darker leaves. 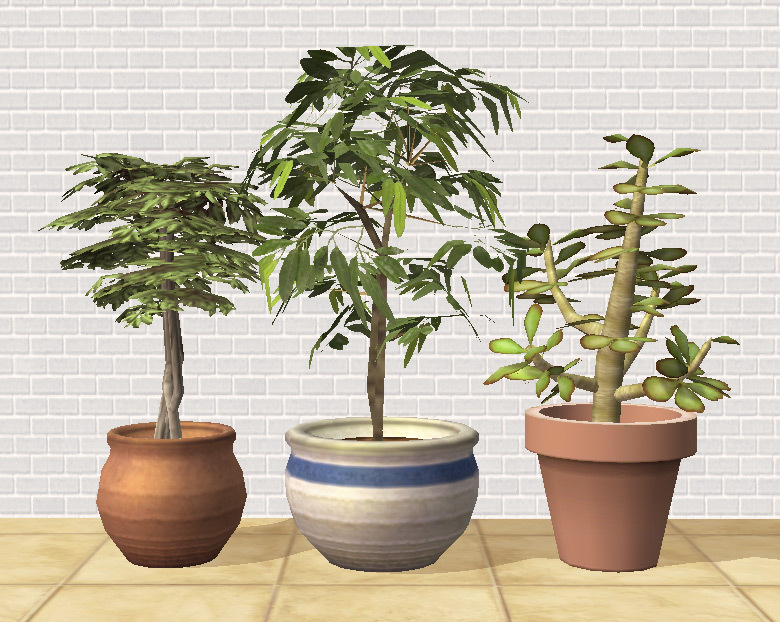 The pot matches the Maxis rubber tree pot (but is reshaped/remapped) and is linked to its texture. Can also be placed on tables. Larger version of the "Falling Fern" in a "Hydroponic Garden" pot (I used the original low-poly version of the pot for this one, since it's mostly hidden behind the leaves anyway). Can also be placed on tables. This is the slightly modified base of the agave tree (that weird-looking alien plant), in a re-shaped "Fruitless Fig Tree" pot. Edit of the rubber tree, in a re-shaped "Simulated Succulent" pot. Pictured with one of the succulent recolours. Potted Shrub – The top of the "No-Fuss Ficus" acting as shrub, in a re-shaped "Simulated Succulent" pot. Pictured with one of the succulent recolours. This is the "Large Succulent" plant (see below) with an invisible succulent recolour. You can make all of the succulent-inhabited pots "empty" this way if you're in need of empty pots. Three of the sunflowers from the 45§ sunflower vase in one of the vases from the "Musée Public" sculpture. Can also be placed on tables. The oleander shrub, in a re-shaped "Simulated Succulent" pot. I believe the shrub mesh is not edited (or not so much so that you could see a difference). The watering can accessory, made buyable and enlarged to a more heavy-duty size. There is a small version (original size) as well, not pictured since it's identical except for the size. Both are placed diagonally/off-center, because who lines up their watering cans with a ruler? Taken out of its pea-sized pot, slightly reshaped, and put in a "Simulated Succulent" pot. Pictured using a recolour of the succulent. The "Fruitless Fig Tree", slightly reshaped, in a larger "Simulated Succulent" pot. Pictured using a recolour of the succulent. On the screenshot, the lowest branch of the tree is backwards but this is fixed – I only didn't take a new screenshot afterwards. A larger version of the "Simulated Succulent", in a pot from the "Hydroponic Garden" reward. Smaller, edited version of the "Falling Fern", in a pot from the "Hydroponic Garden" reward sitting on a dessert plate. Smaller and edited version of the "Simulated Succulent", in a pot from the "Hydroponic Garden" reward. Smaller and edited version of the "Hanging Hosta", in a pot from the "Hydroponic Garden" reward. The tray it sits on is from the "Anytime Candles" and is recolourable. "Blue Sky Bonsai", now with a more reasonable poly count, in a reshaped pot from the rubber tree. Shown with a rubber tree recolour (black pot). A small part of the rubber tree in a "Hydroponic Garden" pot. A smaller part of the rubber tree, again in a pot from the "Hydroponic Garden" reward. Two tulips in a reshaped version of the 35§ glass vase. These are garden tulips and will pick up any "Tip-Top Tulips" recolours you have, so it corresponds to what your sims actually have in their garden. Daffodils from the 35§ glass vase, with leaf texture from the tulip flowerbed (not very detailed, but it's the best I could find), on a tray from the "Anytime Candles" sculpture. Tray and flowers are recolourable. One of the daffodils from the 35§ glass vase, slightly enlarged, in one of the "Musée Public" vases. Reduced version of the blue hydrangea shrub, in a pot from the "Hydroponic Garden" reward. I'm afraid the original shrub isn't recolourable, so this isn’t either. Daisies from the "Daisies of Our Lives" flowerbed, in a "Hydroponic Garden" pot. Uses all textures of the daisies flowerbed. Re-shaped and much smaller version of the bougainvillea shrub, in a pot from the "Hydroponic Garden" reward. This uses all textures of the original shrub. Tiny version of the agave tree ("Century Plant"), in a shrunk and reshaped "Simulated Succulent" pot. The same orchid that is already in the game, in a less eccentric pot (this is the (slightly re-shaped) pot from the "Falling Fern", which is quite underappreciated since it's normally hidden behind all the fern). The plate it sits on is the dessert plate. A baby cactus tree in a small "Hydroponic Garden" pot. Uses the texture of the large outdoor cactus. Minimalistic rubber tree, in a shrunk and reshaped "Simulated Succulent" pot. Shown with a succulent recolour. Taken from the "Prickly Pears" flowerbed and put in a shrunk and reshaped "Simulated Succulent" pot. Shown with a succulent recolour. Edit of the "Hanging Hosta", in a shrunk and reshaped "Falling Fern" pot. All of the table plants can also be placed on the floor, except for the glass vase with tulips. I made sure that none of my meshes will poke through walls. Everything has a proper groundshadow except for the watering cans (those are very outdoorsy-looking, and groundshadows only show up indoors, so it would have been kind of pointless). 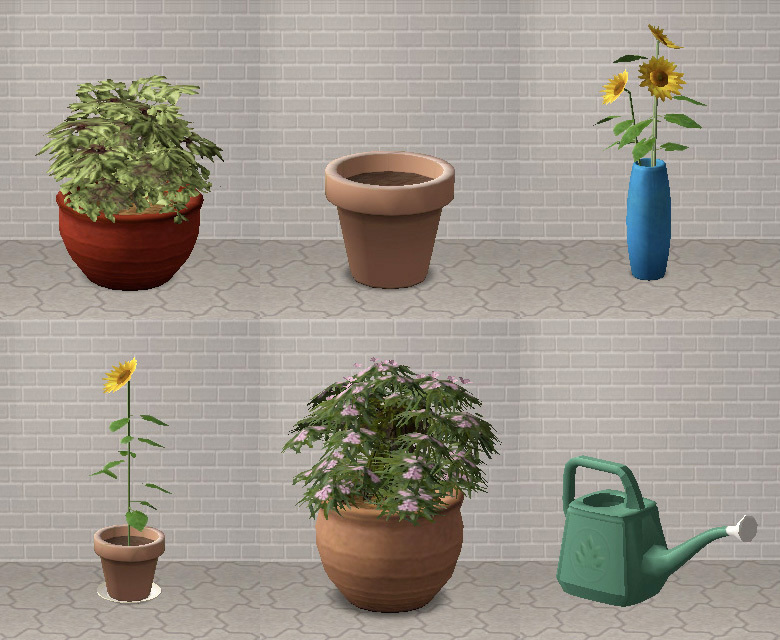 Feel free to recycle these meshes, particularly if you do something that involves sunflowers, tulips, bonsais or ferns; mine are probably still far from perfect but at least there's no more obvious holes, broken necks, or leaves hanging in mid-air now. Made with Blender and SimPE. Many thanks to IgnorantBliss, Numenor, JWoods, Maylin, Lethe and everyone else who posted information and tutorials in the Create section, and also to the people who take care of the blenderwiki.